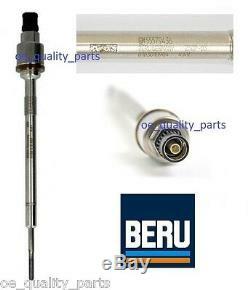 1x Original Genuine OEM Beru Opel Vauxhall Glow Plug With PSG Pressure Sensor For. Opel Vauxhall Insignia Zafira 3 Astra J GTC Mk4 2.0 CDTi. Total length [mm] 179.9. Thread Size M 9x1,0. The bending moment [Nm] 22. Convergence of the cone: 93. OPEL ASTRA GTC J 2.0 BiTurbo CDTI 143kW 1956ccm 194hp 2012/10->..
OPEL ASTRA GTC J 2.0 CDTI 121kW 1956ccm 165hp 2011/10->.. OPEL ASTRA J 2.0 BiTurbo CDTI 143kW 1956ccm 194hp 2012/12->..
OPEL ASTRA J 2.0 CDTI 118kW 1956ccm 160hp 2009/12->.. OPEL ASTRA J 2.0 CDTI 121kW 1956ccm 165hp 2011/06->..
OPEL ASTRA J Sports Tourer 2.0 BiTurbo CDTI 143kW 1956ccm 194hp 2012/12->.. OPEL ASTRA J Sports Tourer 2.0 CDTI 118kW 1956ccm 160hp 2010/10->.. OPEL ASTRA J Sports Tourer 2.0 CDTI 121kW 1956ccm 165hp 2011/08->.. OPEL INSIGNIA 2.0 Biturbo CDTI 140kW 1956ccm 190hp 2008/07->..
OPEL INSIGNIA 2.0 Biturbo CDTI 143kW 1956ccm 195hp 2012/01->.. OPEL INSIGNIA 2.0 Biturbo CDTI 4x4 143kW 1956ccm 195hp 2012/01->..
OPEL INSIGNIA 2.0 Biturbo CDTI 4x4 140kW 1956ccm 190hp 2009/05->.. OPEL INSIGNIA 2.0 CDTI 81kW 1956ccm 110hp 2008/07->.. OPEL INSIGNIA 2.0 CDTI 88kW 1956ccm 120hp 2012/03->..
OPEL INSIGNIA 2.0 CDTI 96kW 1956ccm 131hp 2008/07->.. OPEL INSIGNIA 2.0 CDTI 120kW 1956ccm 163hp 2013/07->.. OPEL INSIGNIA 2.0 CDTI 118kW 1956ccm 160hp 2008/07->..
OPEL INSIGNIA 2.0 CDTI 103kW 1956ccm 140hp 2013/07->.. OPEL INSIGNIA 2.0 CDTI 4x4 118kW 1956ccm 160hp 2010/06->.. OPEL INSIGNIA 2.0 CDTI 4x4 120kW 1956ccm 163hp 2013/07->.. OPEL INSIGNIA estate 2.0 Biturbo CDTI 143kW 1956ccm 195hp 2012/01->..
OPEL INSIGNIA estate 2.0 Biturbo CDTI 140kW 1956ccm 190hp 2008/07->.. OPEL INSIGNIA estate 2.0 Biturbo CDTI 4x4 143kW 1956ccm 195hp 2012/01->.. OPEL INSIGNIA estate 2.0 Biturbo CDTI 4x4 140kW 1956ccm 190hp 2008/07->..
OPEL INSIGNIA estate 2.0 CDTI 118kW 1956ccm 160hp 2008/07->.. OPEL INSIGNIA estate 2.0 CDTI 96kW 1956ccm 131hp 2008/07->.. OPEL INSIGNIA estate 2.0 CDTI 88kW 1956ccm 120hp 2012/03->.. OPEL INSIGNIA estate 2.0 CDTI 81kW 1956ccm 110hp 2008/07->.. OPEL INSIGNIA estate 2.0 CDTI 103kW 1956ccm 140hp 2013/07->..
OPEL INSIGNIA estate 2.0 CDTI 120kW 1956ccm 163hp 2013/07->.. OPEL INSIGNIA estate 2.0 CDTI 4x4 120kW 1956ccm 163hp 2013/07->.. OPEL INSIGNIA estate 2.0 CDTI 4x4 118kW 1956ccm 160hp 2010/06->..
OPEL INSIGNIA sedan 2.0 Biturbo CDTI 140kW 1956ccm 190hp 2008/07->.. OPEL INSIGNIA sedan 2.0 Biturbo CDTI 143kW 1956ccm 195hp 2012/01->.. OPEL INSIGNIA sedan 2.0 Biturbo CDTI 4x4 143kW 1956ccm 195hp 2012/01->.. OPEL INSIGNIA sedan 2.0 Biturbo CDTI 4x4 140kW 1956ccm 190hp 2008/07->..
OPEL INSIGNIA sedan 2.0 CDTI 88kW 1956ccm 120hp 2012/03->.. OPEL INSIGNIA sedan 2.0 CDTI 81kW 1956ccm 110hp 2008/07->.. OPEL INSIGNIA sedan 2.0 CDTI 120kW 1956ccm 163hp 2013/07->.. OPEL INSIGNIA sedan 2.0 CDTI 96kW 1956ccm 131hp 2008/07->.. OPEL INSIGNIA sedan 2.0 CDTI 103kW 1956ccm 140hp 2013/07->..
OPEL INSIGNIA sedan 2.0 CDTI 118kW 1956ccm 160hp 2008/07->.. OPEL INSIGNIA sedan 2.0 CDTI 4x4 120kW 1956ccm 163hp 2013/07->.. OPEL INSIGNIA sedan 2.0 CDTI 4x4 118kW 1956ccm 160hp 2010/06->.. OPEL ZAFIRA TOURER C (P12) 2.0 CDTi 96kW 1956ccm 130hp 2011/10->..
OPEL ZAFIRA TOURER C (P12) 2.0 CDTi 81kW 1956ccm 110hp 2011/10->.. VAUXHALL ASTRA GTC Mk VI (J) 2.0 BiTurbo CDTI 143kW 1956ccm 194hp 2012/12->..
VAUXHALL ASTRA GTC Mk VI (J) 2.0 CDTi 121kW 1956ccm 165hp 2011/10->.. VAUXHALL ASTRA Mk VI (J) 2.0 BiTurbo CDTI 143kW 1956ccm 194hp 2012/12->.. VAUXHALL ASTRA Mk VI (J) 2.0 CDTi 121kW 1956ccm 165hp 2011/08->.. VAUXHALL ASTRA Mk VI (J) 2.0 CDTi 118kW 1956ccm 160hp 2009/12->.. VAUXHALL ASTRA Mk VI (J) sedan 2.0 BiTurbo CDTI 143kW 1956ccm 194hp 2012/12->..
VAUXHALL ASTRA Mk VI (J) Sports Tourer 2.0 BiTurbo CDTI 143kW 1956ccm 194hp 2012/12->.. VAUXHALL ASTRA Mk VI (J) Sports Tourer 2.0 CDTi 121kW 1956ccm 165hp 2011/08->..
VAUXHALL ASTRA Mk VI (J) Sports Tourer 2.0 CDTi 118kW 1956ccm 160hp 2010/10->.. VAUXHALL INSIGNIA 2.0 Biturbo CDTI 143kW 1956ccm 195hp 2012/03->.. VAUXHALL INSIGNIA 2.0 Biturbo CDTI 4x4 143kW 1956ccm 195hp 2012/03->.. VAUXHALL INSIGNIA 2.0 CDTI 81kW 1956ccm 110hp 2008/07->.. VAUXHALL INSIGNIA 2.0 CDTI 118kW 1956ccm 160hp 2008/07->..
VAUXHALL INSIGNIA 2.0 CDTI 140kW 1956ccm 190hp 2008/10->.. VAUXHALL INSIGNIA 2.0 CDTI 96kW 1956ccm 130hp 2008/07->.. VAUXHALL INSIGNIA 2.0 CDTI 4x4 140kW 1956ccm 190hp 2009/05->..
VAUXHALL INSIGNIA 2.0 CDTI 4x4 118kW 1956ccm 160hp 2008/07->.. VAUXHALL INSIGNIA estate 2.0 Biturbo CDTI 143kW 1956ccm 195hp 2012/03->.. VAUXHALL INSIGNIA estate 2.0 Biturbo CDTI 4x4 143kW 1956ccm 195hp 2012/03->..
VAUXHALL INSIGNIA estate 2.0 CDTI 96kW 1956ccm 130hp 2008/07->.. VAUXHALL INSIGNIA estate 2.0 CDTI 140kW 1956ccm 190hp 2008/11->.. VAUXHALL INSIGNIA estate 2.0 CDTI 81kW 1956ccm 110hp 2008/07->.. VAUXHALL INSIGNIA estate 2.0 CDTI 118kW 1956ccm 160hp 2008/07->.. VAUXHALL INSIGNIA estate 2.0 CDTI 4x4 140kW 1956ccm 190hp 2009/05->.. VAUXHALL INSIGNIA estate 2.0 CDTI 4x4 118kW 1956ccm 160hp 2008/07->.. VAUXHALL INSIGNIA sedan 2.0 Biturbo CDTI 143kW 1956ccm 195hp 2012/03->.. VAUXHALL INSIGNIA sedan 2.0 Biturbo CDTI 4x4 143kW 1956ccm 195hp 2012/03->.. VAUXHALL INSIGNIA sedan 2.0 CDTI 140kW 1956ccm 190hp 2008/11->.. VAUXHALL INSIGNIA sedan 2.0 CDTI 96kW 1956ccm 130hp 2008/07->.. VAUXHALL INSIGNIA sedan 2.0 CDTI 81kW 1956ccm 110hp 2008/07->.. VAUXHALL INSIGNIA sedan 2.0 CDTI 118kW 1956ccm 160hp 2008/07->.. VAUXHALL INSIGNIA sedan 2.0 CDTI 4x4 118kW 1956ccm 160hp 2008/07->.. VAUXHALL INSIGNIA sedan 2.0 CDTI 4x4 140kW 1956ccm 190hp 2009/05->.. VAUXHALL ZAFIRA Mk III (P12) 2.0 CDTi 96kW 1956ccm 130hp 2011/10->.. VAUXHALL ZAFIRA Mk III (P12) 2.0 CDTi 81kW 1956ccm 110hp 2011/10->.. PLEASE CHECK THE PART NUMBER ON YOUR OLD PART - IT HAS TO MATCH ONE OF THE PART NUMBERS MENTIONED IN THIS LISTING EVEN IF YOUR VEHICLE IS MENTIONED IN COMPATIBILITY LISTS AS THERE MAY BE SOME VARIATIONS. BY ORDERING THIS ITEM YOU AGREE WITH THE ABOVE STATEMENT. IF YOU ARE NOT SURE ABOUT COMPATIBILITY, PLEASE SEND US A MESSAGE WITH YOUR VIN CODE AND VEHICLE DETAILS. GENERALLY, ALL OUR ITEMS ARE HELD IN STOCK. NO WAITING PERIODS, IMMEDIATE DISPATCH. CUSTOMERS SHOULD SATISFY THEMSELVES THAT ANY ITEM CHOICE MADE IS SUITABLE FOR THEIR INTENDED PURPOSE OR USE. The item "Beru Glow Plug PSG Sensor Opel Vauxhall Insignia Zafira Astra J GTC Mk4 2.0 CDTi" is in sale since Thursday, November 12, 2015. This item is in the category "Vehicle Parts & Accessories\Car Parts\Ignition\Glow Plugs". The seller is "oe_quality_parts" and is located in Bialystok. This item can be shipped worldwide.